This is a VERY simple recipe that incorporates fresh fruit, dairy, and whole grains to make quick snack. 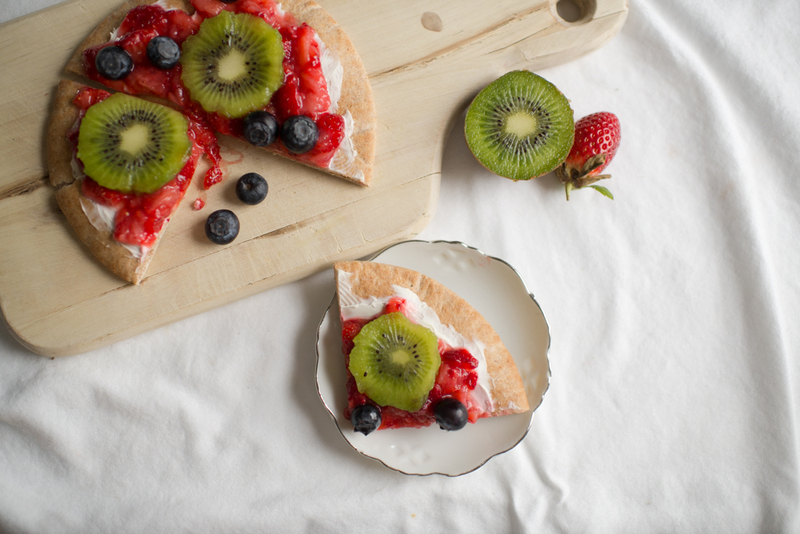 This can easily be served as a quick breakfast pizza or as a school lunch. We love recipes that serve many purposes! Resist the urge to add sweeteners to your purée. If you have nice sweet strawberries, you should not have to have anything. Note the recipe makes several servings, but you may only need one or two at a time. Mash a few strawberries at a time with a potato masher or fork. If the purée is too thin, strain a bit of the juice off. Spread a layer of cream cheese on each pita. Spread a few teaspoons of strawberry purée on top. Garnish with kiwi slices and other favorite fruits. Cut into quarters and serve. If cut into tiny little peices this recipe can be a great fingerfood idea. If your baby has not tried kiwi or strawberry yet, try other “toppings” or fruit purées that your baby already likes.